When I first discovered raw cheesecakes I was amazed at how similar they tasted to a traditional baked cheesecake. This amazement was quickly replaced by excitement as, being intolerant to dairy, this meant I could now eat one of my favourite desserts again! The other advantage of a raw cheesecake is that all the nutrients are in their original form i.e. unaffected by heat, making it a much healthier dessert – when eaten in moderation of course. That said, not all raw cheesecakes are created the same. 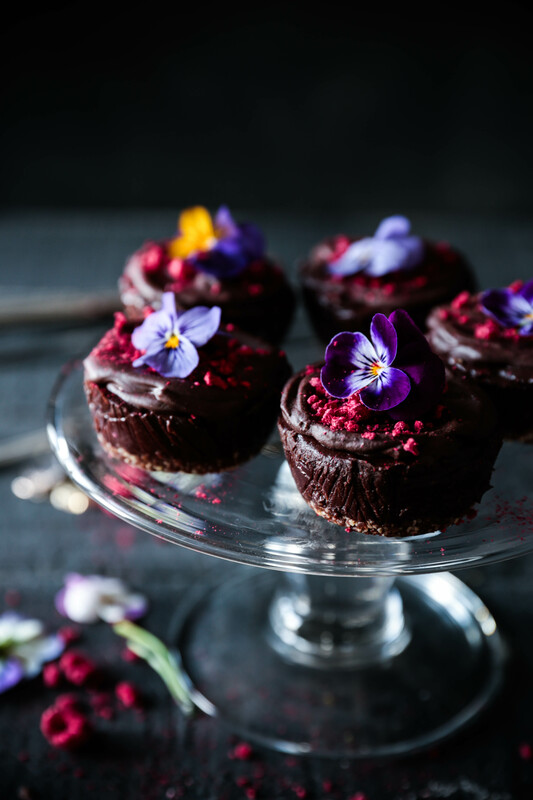 I’ve tasted many amazing ones, Little Bird Organics in particular has the recipe perfected and create some awesome flavours, and I’ve tasted some that were not so good. Needless to say I was pretty excited to try my hand at making one, especially when I got hold of the aforementioned ‘experts’ cookbook. My first attempt using their recipe turned out pretty damn well, however, it was very labour intensive. Activating and drying the nuts for the base was pretty fiddly without a dehydrator (and I’m not even sure very successful) and cracking open a couple of young coconuts to scoop out the flesh was a task in itself – especially if you don’t have the special little coconut axe! I used a blunt knife as suggested and the tops didn’t really pop off as they were supposed to. So after hacking them off I then had to pick all the little bits of splintered shell out of the precious flesh inside. I’m not even entirely sure I had the requisite young coconuts to start with as it turns out they can bleach older coconuts to make them look like young ones (seriously?! ), which may have been why the inside flesh wasn’t easy to scoop out. One of the coconuts I eventually got open had odd pink coloured water and flesh which I’m pretty sure meant it was bad. Needless to say, even though the cheesecake tasted amazing (we had it on Christmas day and it was a massive hit! ), I haven’t attempted the recipe again as it’s just so much easier (and probably more cost effective!) to simply buy one from Little Bird themselves. Recently however, I was on a cookbook shoot and one of the recipes was a raw cheesecake. This one was entirely cashew based with no young coconut flesh to be seen, which got me thinking. Surely there’s a way to make a raw cheesecake in a much simpler way AND still have it taste amazing (plus a little lighter on the wallet!). So after some recipe tinkering, this is my version of a raw chocolate cheesecake or cheesecakes in this case. It still requires a high speed blender to make the filling, unfortunately I don’t think you can get around this unless you’re happy with lumpy cheesecakes. However, it’s a lot less time consuming and the ingredients don’t cost quite so much. That said, a raw cheesecake is probably never going to be a budget friendly dessert unless cashews suddenly rain from the sky. 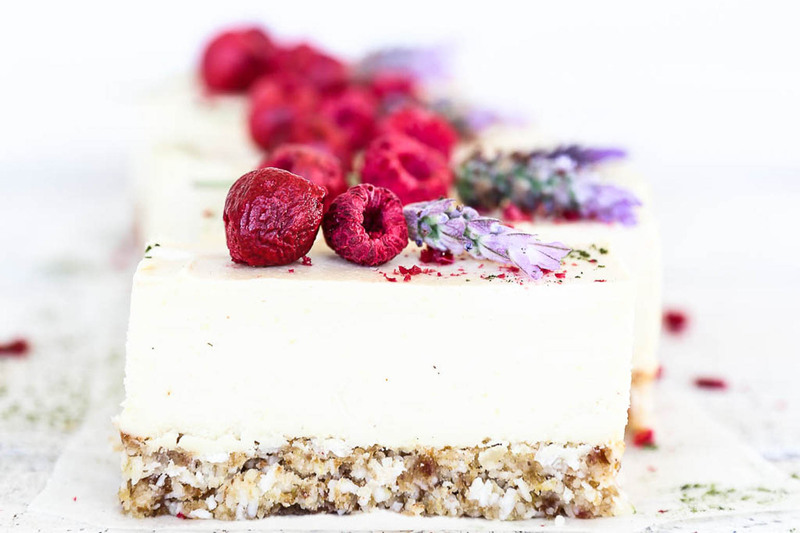 But as raw cheesecakes are very rich due to their high protein and good fat content, you can only eat small amounts at a time so they do go a lot further. This is also why I’ve created this recipe as little mini cheesecakes as we found them the perfect serving size. 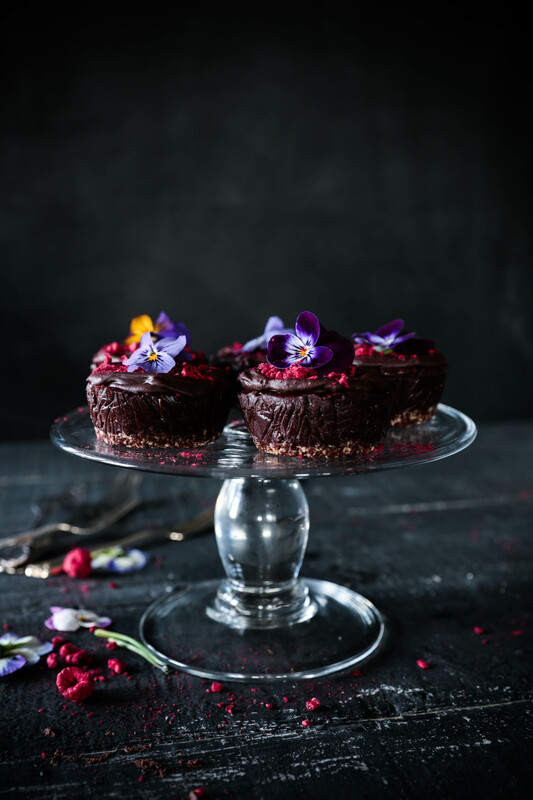 These raw chocolate cheesecakes contain no dairy, gluten or refined sugar. 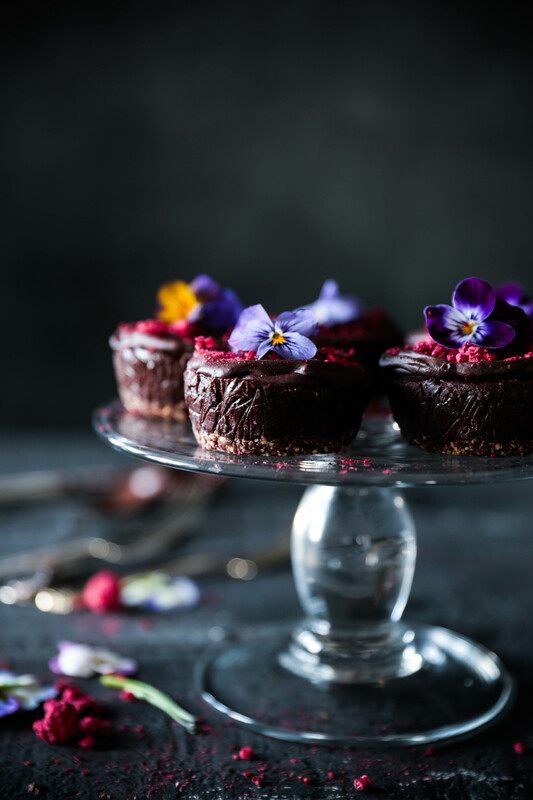 The ‘cheesecake’ filling is made from a base of cashew nuts which are soaked for 2-4 hours, then blended with raw cacao and pure maple syrup to create a lovely creamy filling. Lemon juice creates the traditional cheesecake tang and coconut oil and raw cacao butter add to the creaminess and ensure the whole thing sets! The traditional biscuit crumb base is replaced by a combination of nuts, dried coconut, dates and coconut oil, and the whole recipe takes about an hour to prepare and another half to set – but the end result is definitely worth it! Line a 12 hole muffin pan with cling film. Place the desiccated coconut into a food processor and blend until it starts to break down. Add the almonds and blend until they are half ground and then add the cashews, cacao powder and salt. Blend until the mixture looks like chunky crumbs. Add the medjool dates (ensuring you have removed the pitts!) and blend until they are well combined. Lastly add the melted coconut oil while the motor is running. Press a spoonful of mixture into the bottom of each muffin hole and place the pan in the fridge to set. Place the cashews in a bowl, cover with filtered water and leave to soak for 2-4 hours. Drain the cashews and rinse well. Place cashews in a high speed blender (e.g. Vitamix/Blendtec) along with the maple syrup, lemon juice, vanilla seeds, raw cacao powder and sea salt. Blend until smooth – start off on low using the stirring stick to keep things moving and build up speed to get it smooth. Make sure you don’t over heat (cook!) the mixture as the blender blades can create a lot of heat. If it starts to feel warm place the jug in the fridge for 10 minutes or so. When the mixture is smooth add the coconut oil and cacao butter gradually. Again you will need to use the stick to keep everything moving. 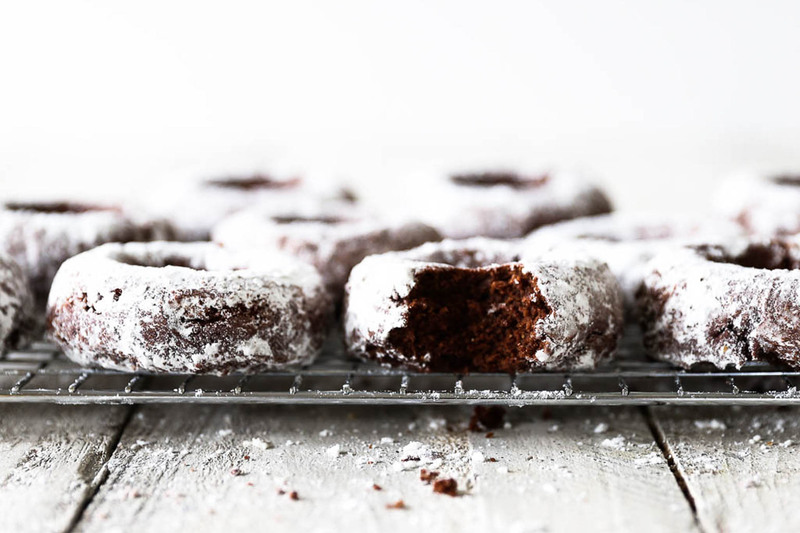 When the chocolate filling is smooth, spoon it into the muffin holes and smooth off the tops. Return to the fridge to chill. Gently melt the coconut oil and cacao butter together by placing in a bowl set over a steaming pot of water with the heat turned off. Remove the bowl from the heat and stir in the maple syrup, cacao powder and salt. Give it a good whisk to make sure there are no lumps. At this stage you probably want to leave it to cool as you are aiming for a spreadable ganache type consistency. If it’s too runny it will slide off the top of the cheesecakes. You can either leave it at room temperature or place it in the fridge for a few minutes to cool. If it cools too much and starts to set or becomes lumpy, simply place it on top of the steaming water again and whisk well. Pop the cheesecakes out of the muffin tin and place on a lined tray. When the ganache is at spreadable consistency, spread a layer on top of each cheesecake. 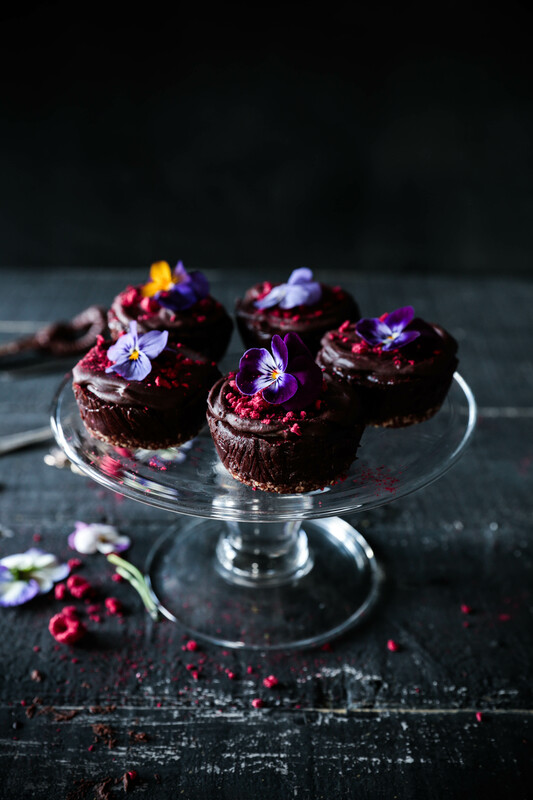 Decorate with a sprinkle of freeze dried raspberries and edible flowers if using. Keep the cheesecakes in the fridge until ready to serve, they will last up to 5 days in the fridge or a few weeks in the freezer. Note on choosing coconut oil: it is important which type of coconut oil you use. A lot of the cheaper coconut oils are heat or chemical processed which destroys the inherent nutrients that have made coconut oil so popular recently. Look for ‘cold pressed, extra virgin, organic’ or ‘unrefined raw’ coconut oil. Even though it may cost a little more, it is WAY better for you. Coconut oil contains high quantities of lauric acid which has anti-bacterial, anti-fungal, anti-viral and anti-inflammatory properties. It boosts your immune system and metabolism, lowers blood pressure and helps with the absorption of minerals. Even though coconut oil is a saturated fat, it is considered a ‘heathier’ fat because lauric acid is a medium chain fatty acid. This means it is easily digestible and processed by your body in the same way as carbohydrates as a direct source of energy. Note on choosing maple syrup: make sure you get the real deal! There are quite a few maple syrups out there that are just maple flavoured sugar syrup, full of additives and often high fructose corn syrup. Pure maple syrup lists only “pure maple syrup” under ingredients and is made by a natural process of extracting the sap from maple trees, evaporating off excess water and filtering to remove impurities. 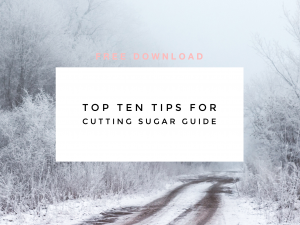 Pure maple syrup is an unrefined sugar and has a lower glycemic index than refined sugar. It contains minerals and antioxidants such as calcium, potassium, iron, manganese and zinc, unlike refined sugar which contains none. Maple syrup is still a form of sugar however, so while it is better choice than refined sugar it is still best used in moderation. 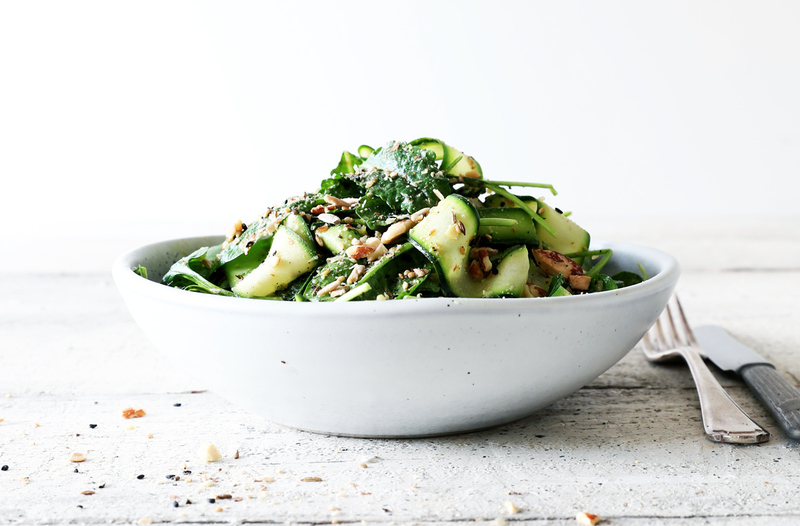 Feel free to use less in this recipe if it suits your tastes and if you do decrease the amount of maple syrup, replace the quantity you leave out with an equal amount of either filtered water or nut milk. These little cheesecakes are so pretty! I almost wouldn’t want to eat them! Wow! I just saw these on Foodgawker, and I had to stop by to tell you how great they look.